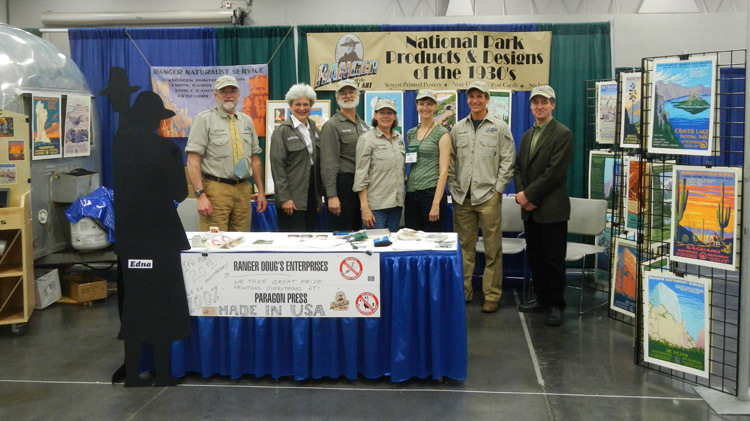 Once a year I usually attend the PLA (Public Lands Alliance) Convention--where our National Parks peruse and purchase products to interpret our parks. In 2007 five of us attended to celebrate our Series III release of contemporary images. 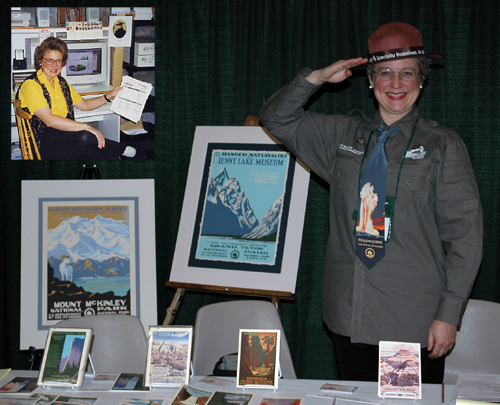 Meet Ranger Doug "Ranger of the Lost Art" I began this company as a hobby in 1993 to fundraise for Grand Teton National Park, my Alma Mater, where I spent 7 years as a seasonal ranger. I and now publish over 50 old park designs in posters, cards and stickers. I'm also a dentist and after 20 years of private practice, I gave up the Seattle city life for the backwaters of Alaska in Public Health and have provided dental services from Barrow Alaska to the South Pole! . Visit Doug's Blog. This is the kiva entrance, Alcove House, Bandelier National Monument--compare with the Bandelier Poster. Now we couldn't do anything without a good graphic design guy and Brian Maebius is that guy. He puts everything in pixels and bytes on Adobe Illustrator and is acknowledged as co-artist on much of our work. He's also a fine artist, geologist, and former seasonal park ranger--Badlands National Park where he has a mound of dirt named after him; actually a paleontology site he found! If you've visited the Draper Museum of Natural History in Cody, Wyoming, you've seen some of his geology designs and artwork. Brian lives in Dripping Springs, Texas with his wife and two children and.......dinosaur tracks traipsing through his property. Finally, we have our screen printer, Scott Corey. 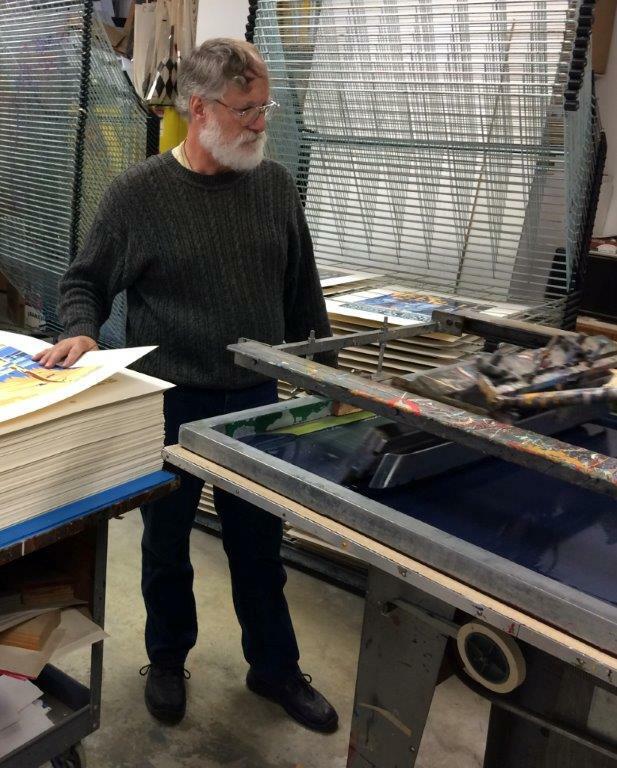 Corey Brothers is a third generation silk-screen printing company that produces our actual posters in the same methods used by the WPA-CCC artists in 1938. Scott sings barbershop quartets-quite a versatile guy. His brother, Cam, who passed away in 2011 from ALS, also printed with Scott since 1993! We have also engaged Cole Graphic Solutions, Tacoma WA to print for us. 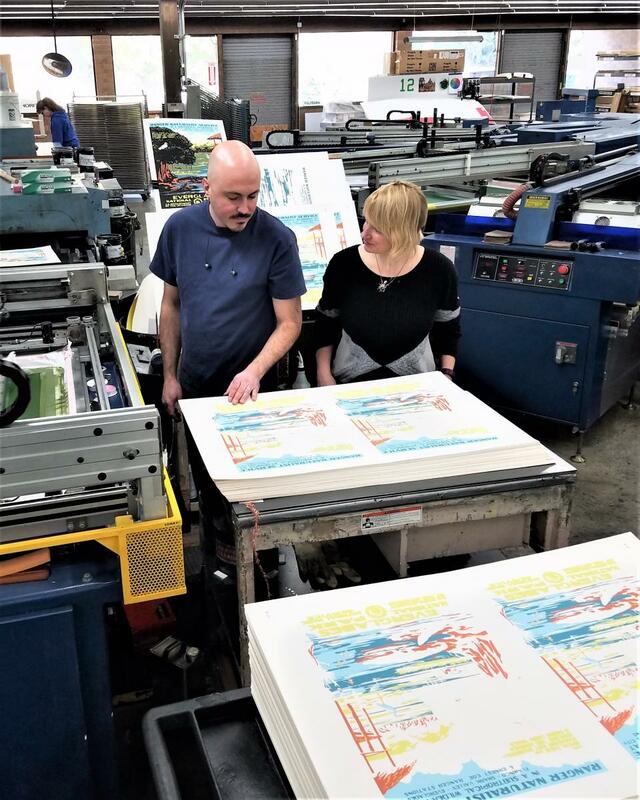 Here Darren and Rochelle examine the forth color run of the Everglades print. We now print about 50 park and monument designs using the screen printing method. Thank you Cole for joining our mission! And here's my sidekick, Lisa Bergman: Lisa is also a concert pianist and accompanist, is a radio announcer for Classical KING-FM, is affiliated with the Icicle Creek Music Center, and...Ranger Doug's Enterprises in Seattle. After 18 years of faithful and loyal service, Lisa is retiring! Thank you Lisa for all your contributions--there was no finer side-kick! When I first started publishing these historic prints Yellowstone National Park wouldn't carry them so I finally went to Hamilton Stores who were the concessions at the time for the previous 88 years. John Grieve, one of their principal buyers, gave me display space in four of his top stores and we sold $60,000 worth of prints in that park in three months the following summer. 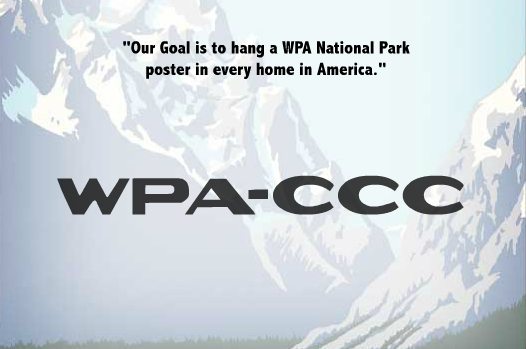 I later went back to the park (different stores than the concessions') and asked again if they would carry the posters in the NPS bookstores and they refused me again. 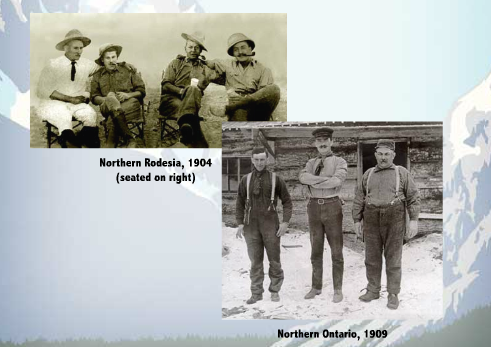 I argued that I was a former ranger (Grand Teton) and would prefer to see these profits go directly to the NPS. Finally I toured these stores and found one single box of note cards on the shelf with Fort Marion as the top card (of a mixed set of 8 which included Yellowstone Falls). This last box was way on the back of the shelf and out of sight so they didn't perceive they were out of product (they carried only my note cards, not the posters). The sales person didn't know even what these images represented. At the cash register was a big bowl of toe rings (rings that you put on your toes). I thought this was inappropriate material for a park bookstore and that my silk screen reproductions of the historic art of that park, originally made by the WPA, no less, was a better product than toe-rings. 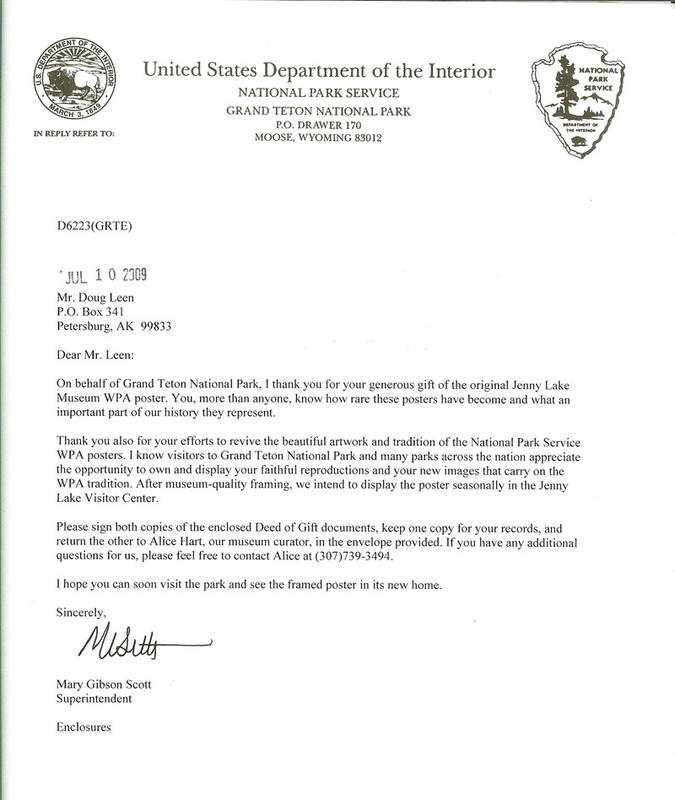 Still to no satisfaction--and then informed them that the NPS has a duty and an obligation to educate the visitors about their parks. These toe rings in my opinion were the same thing as cheap rubber tomahawks that you used to buy in the 1950s during the early TV westerns rage. Ditto for turkey feather headdresses which were cheap off-shore (usually Japan) imitations of what once was a noble item of dress for the American Indian. I told the park if they didn't raise their standards, I was going to print bumper stickers and plaster them on cars in NPS parking lots, much like the "Sea Lion Caves" obtrusive advertising. 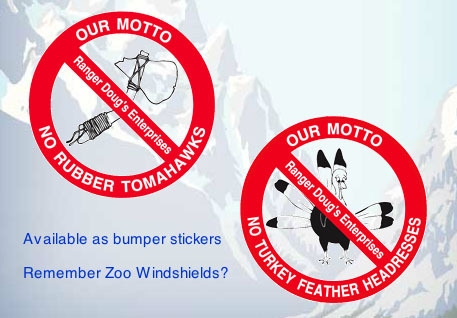 The rest was history--of course, I didn't put these on cars but began sending these out to all my customers as a tongue-in-cheek reminder that the NPS needs to keep their quality up. 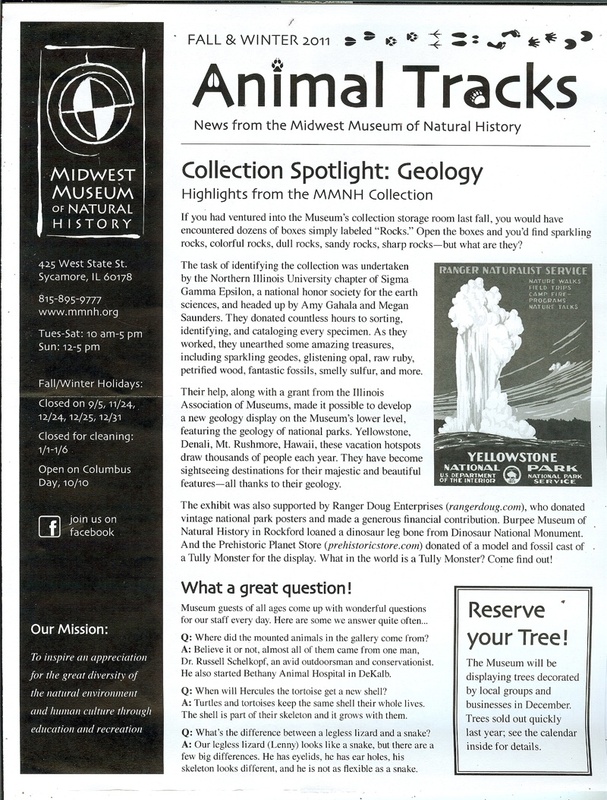 We, at Ranger Doug's Enterprises are the only ones to offer these WPA national park reproductions in silk screen and find them a perfect fit for NPS bookstores to interpret their parks. Many of the internet knock-off "artists" are printing these on on-demand printers and the like. Some are printed in China (Shanghai) on cheap paper; one even includes the lifted Department of the Interior seal which is a federal (and proprietary) seal. Big Bend National Park actually approved these Chinese/Seal versions. About 10 years ago, I came up with a red, white & blue American flag with "Made in America" on it and within a week, one competitor (who prints in Shanghai) put a front page notice up on his website about how of every dollar spent on their products, $0.85 stays in the US. What that really means is that he prints/ships for only $$0.15 and doubles his selling price six times! You may read that notice here: http://www.impactphotographics.com/MadeInUsa.asp This is a bunch of hooey! So in short, these are simply reminders to the parks to keep their standards high and stock our quality, hand-made (in the USA) screen prints. Oh, and they are extremely popular on the Indian Reservations. Student Conservation Association; to provide tools to restore CCC projects (read thank you letter here). 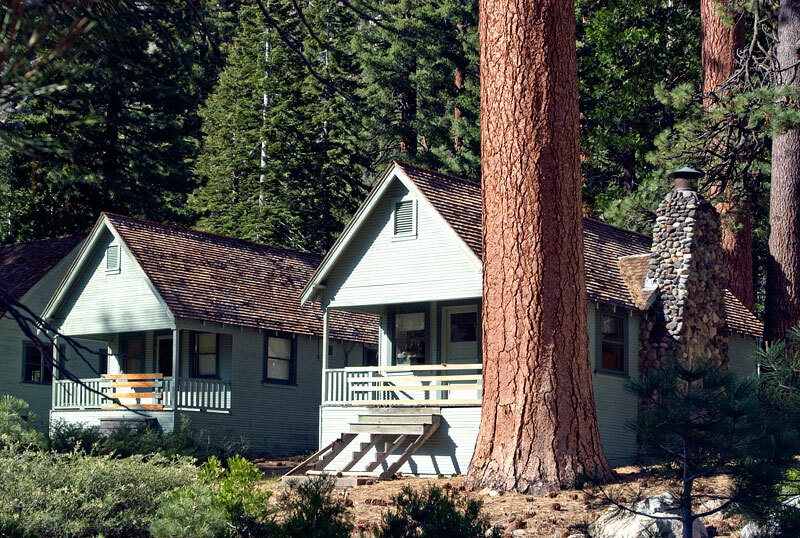 Our continued support of the SCA is in line with the original CCC projects instituted by the FDR administration to rebuild our national and state parks. $2500. National Park Traveler (now a 501.C.3--$250. To Death Valley National Park--Scotty's Castle Preservation Fund--$5000. 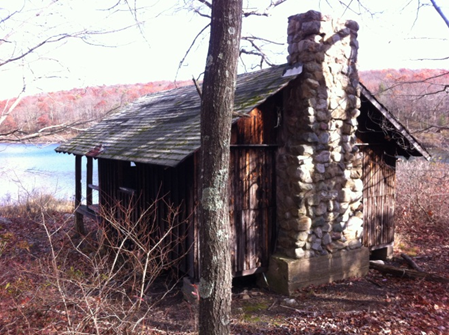 Student Conservation Association: $2000 to provide tools to restore cabins at Delaware Water Gap National Recreation Area. The Grand Rescue Film Project through the Utah Film Center--a documentary film of the 1967 Grand Teton North Face rescue, $2000. Grand Teton National Park -- Jenny Lake original WPA poster donated back to Grand Teton National Park. 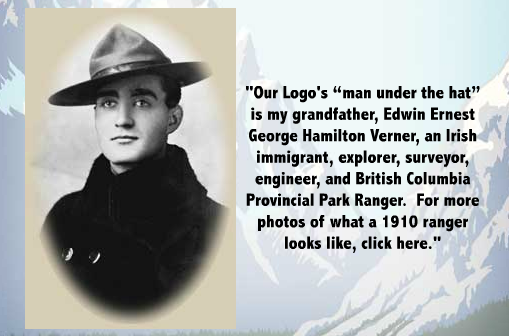 This poster will be displayed at the Jenny Lake Museum in the summer season. View Details. Antarctic Heritage Trust -- $1000 for preservation of the "Scott Hut" at Point Evans, Ross Island, Antaractica. 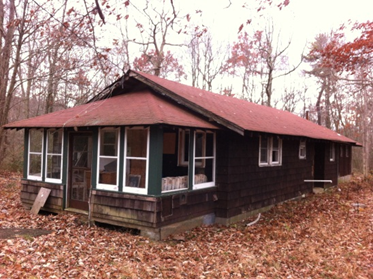 Tour this hut with Ranger Doug here. 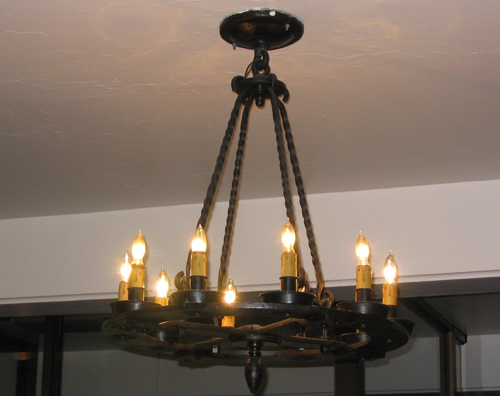 Great Smoky Mountains National Park $1000 for CCC Original Lighting Restoration. See photo. 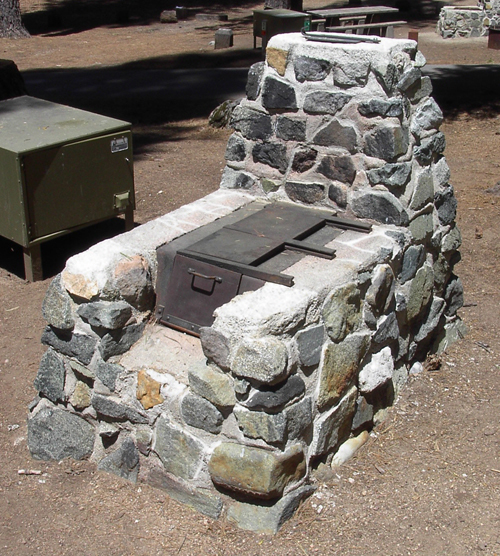 Calaveras State Park, California -- $2000 to to rebuild CCC built campground stoves. See photo. Mt. Rainier National Park -- $2000 via the Student Conservation Association to help in rebuilding flood damaged roads and trails. Mesa Verde Museum Association -- $1000 for their Centennial Plein Air Painting Exhibition. Antarctic Historic Trust -- $1000 for Shackleton's Hut at Cape Royds, Antarctica, listed by the World Monument Society as one of the top 100 threatened historic sites on the planet. 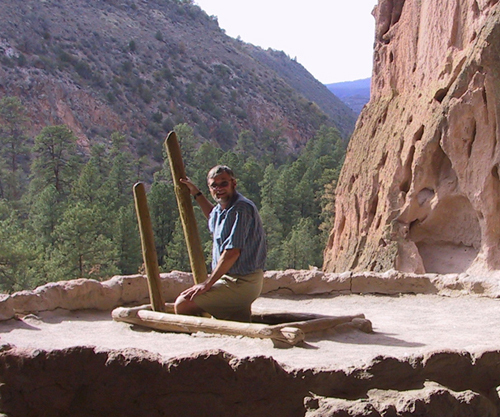 Bandelier National Monument -- $1000 to curatorial and restoration of CCC buildings. 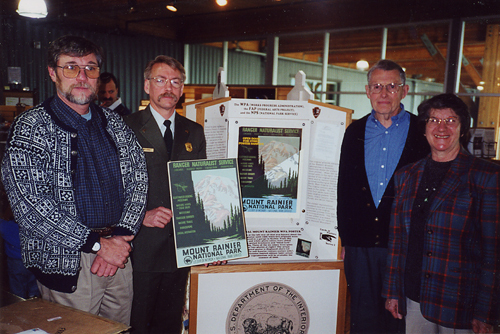 Murie Center, Jackson Hole, Wyoming --$1000 for cabin restoration. Mt. 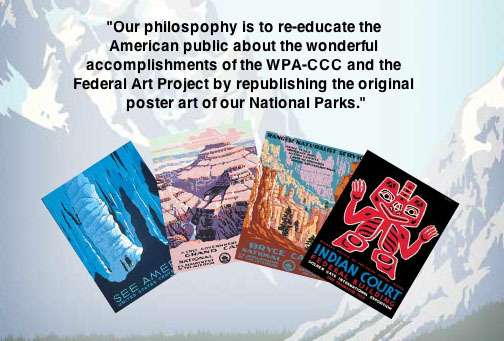 Rainier National Park --Facilitated donated two original WPA posters back to that park. See photo.